Mother's Day is almost here. Instead of the traditional birthstone bracelet or name bracelet, give Mom a gift she can wear all year 'round. 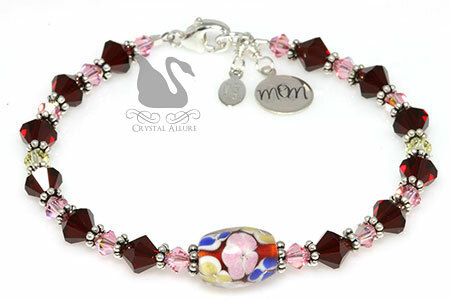 Shower Mom with a bouquet of our beautiful Garden of Love handmade beaded bracelets. 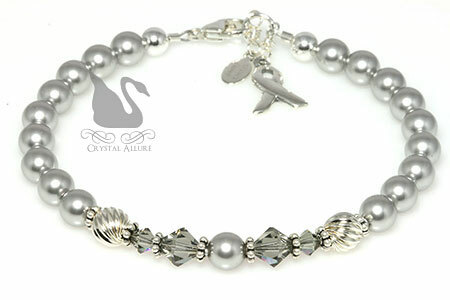 A unique mothers bracelet she will treasure for years to come. 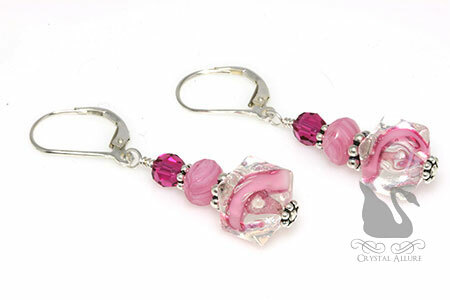 Designed with crystal golden shadow, aurora borealis (AB) light rose Swarovski Crystals, accented with soft chrysolite Swarovski Crystals, Bali bead spacers, with a sparkling centered handcrafted lampwork glass bead featuring a pink rose flower design. Finished with sterling silver lobster clasp, hand stamped MOM charm and our signature jewelry tag. Bracelet measures 7-1/4". Designed with peridot and chrysolite Swarovski Crystals, accented with pink grade A fiber optic cats eye beads, Bali bead spacers, with a beautiful centered handcrafted lampwork glass bead featuring a pink rose flower design. Finished with sterling silver lobster clasp, hand stamped MOM charm and our signature jewelry tag. Bracelet measures 7-1/2". Designed with rose and amethyst Swarovski Crystals, accented with emerald Swarovski Crystals and pink grade A fiber optic cats eye beads, Bali bead spacers, with a beautiful centered handcrafted lampwork glass bead featuring a pink rose flower design. Designed with siam, aurora borealis (AB) light rose Swarovski Crystals, accented with soft jonquil Swarovski Crystals, Bali bead spacers, with a beautiful centered handcrafted lampwork glass bead featuring pink, yellow and blue blossom flower design. Browse Mothers Bracelets and Gift Ideas for this upcoming Mother's Day. The American Cancer Society's website states: "About 1 out of 8 invasive breast cancers are found in women younger than 45, while about 2 of 3 invasive breast cancers are found in women age 55 or older." These are sobering statistics considering if you ask any woman, they have either been diagnosed with breast cancer, know someone with breast cancer and/or they know someone who has survived breast cancer. 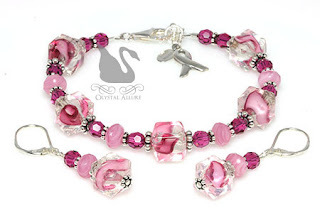 Although October is designated as National Breast Cancer Awareness Month, Crystal Allure Beaded Jewelry is dedicated to raising awareness about breast cancer throughout the year. 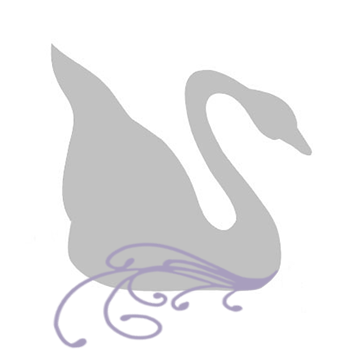 We do this through our original designs of sparkling pink crystal awareness jewelry. This beautiful 7-1/2" design features clear base lampwork glass beads with flowing ribbons of fuchsia and pink colors accented with fuchsia Swarovski Crystals, milky pink Czech bead and sterling Bali. The handmade beaded bracelet is finished with a sterling silver lobster clasp, awareness ribbon charm and our signature jewelry tag. The handmade beaded earrings are sterling silver leverback ear wires measuring 1-1/4" from the bottom of the ear wire.